Like dirt farmers waiting for rain, we trade hopeful little statements while poking the tips of our boots dubiously at the ground where the seeds of prosperous times presumably lie slumbering. "When the economy picks up again," we preface. "When it gets going, rolling, heats up, kicks in gear . . ."
When it does, downtown Napa is ready. Now is a nice time to visit one of the 19 or so spots to stand, swirl and sip wine in the revamped gateway to Napa Valley before the harvest crowds descend. Now that the hotel construction across the street from this tasting room is complete, it's easy to park right in front.The interior has a low-budget style befitting the combined efforts of a couple of buddies who tank-surf at other area facilities and sell mainly retail out of the shop. Trahan's convivial Chuck Custudio says it's meant to evoke the cellar: dark walls, empty barrels providing the faint aroma of old wood, and a thronelike dog bed fashioned out of barrel staves for Sadie, the requisite winery dog. Wines are shelved, with clever economy, in stacks of wood pallets. Much of their product is sourced from Suisin Valley, Napa's much less popular stepsister to the east. A few minutes from the suburbia seen from the I-80 freeway, Green Valley and Suisun Valley open up onto quiet, California ranch land. Here are a few coveted patches of old vine Zinfandel, and many more new plantings. Also interesting about Trahan and Olabisi wines is that they share remarkable discipline to style, whether from Napa or Suisun. Trahan's 2007 Carneros Chardonnay ($30) skipped malolactic yet yields a hint of golden caramel with echoes of pure oak and notes of artichoke with lemon butter. The Olabisi 2007 Carneros Chardonnay ($40) also presents a more elemental version of Napa Chardonnay, lean with light crackles of acidity, juicy lemon and a tight finish. A racy nose leapt from Olabisi's 2005 Suisun Valley Syrah ($34), showcasing red plum jam and red cherry fruit that's ripe but bright, with toasted chicory. For all that, the finish was unexpectedly firm, but not rustic and drying. Similarly, Olabisi's 2005 Petite Sirah ($45) showed tart plum, black cherry and prune fruit, finishing with a brief astringency. The Trahan 2006 Suisun Valley Cabernet Sauvignon ($30) was even fruitier than the raspberry-tinged 2006 Merlot ($35), with light furry tannin, cran-raspberry and blackcurrant fruit, with basically the same, narrow but not unpleasant finish. These sound wines point to great results when appreciated with the right table fare. Or cellar them until the good times that are surely only a short time ahead, and pair with the steak and lobster that we'll assuredly be having every night. 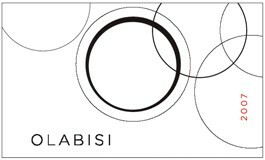 Olabisi and Trahan Tasting Room, 974 Franklin St., Napa. Open daily, noon–5:30pm. Tasting fee, $15. 707.257.7477.